Hello and welcome to the 755th installment of the SWD. Unknown explosion killed one and wounded two civilians in the village of Kafr Nasih in western Aleppo. Syrian Democratic Forces raided four houses in Raqqa city and arrested eight individuals on charges of belonging to / cooperating with the Islamic State. Unknown gunmen wounded three elements of the Syrian Democratic Forces at a checkpoint near the village of Al-Kalib in eastern Raqqa. Hayat Tahrir al-Sham and Ahrar al-Sham reached an agreement resolving yesterday’s tensions in the city of Qalaat al-Madiq. According to the agreement, both sides will release prisoners, as well as hand over individuals involved in tensions to a court. Ahrar al-Sham will also return the checkpoint it captured from Hayat Tahrir al-Sham in the area. Improvised explosive device killed one and wounded one civilian in Al-Ramtha district of Al-Shaafa in eastern Deir al-Zour. Syrian Arab Army arrested the former head of Al-Sheikh Maskin’s local council, Qutaiba Mohammed on unknown charges. 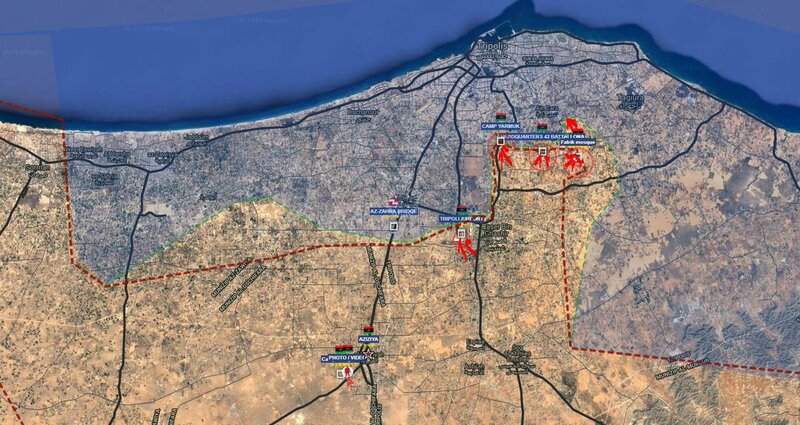 Libyan National Army reportedly took control of Al-Yarmouk camp and the Tripoli International Airport in southern Tripoli from forces loyal to the Government of National Accord. Libyan National Army’s spokesman, Major General Ahmad al-Mismari stated that 28 elements of the army were killed and 92 were wounded during six day-long clashes with Government of National Accord’s forces in southern Tripoli. Al-Mismari also stated that the army’s 166th Battalion downed an ‘Aero L-39ZO Albatros’ military aircraft, which reportedly conducted three air strikes over Gharyan, causing no casualties. Libyan National Army’s spokesman, Major General Ahmad al-Mismari stated that yesterday’s attack in the city of Al-Fuqaha was conducted by Saraya al-Sahara, an affiliate of the Islamic State. Islamic Emirate of Afghanistan (Taliban) overran four Afghan National Security Forces’ checkpoints in Astenad area of Sancharak district. Seven elements of the Afghan National Security Forces were killed and eight were wounded in the encounters. Islamic Emirate of Afghanistan overran four Afghan National Security Forces’ checkpoints in Meer Hamza and Mazadano areas of Muqur district. Eight elements of the Afghan National Security Forces were killed and six were wounded in the encounters. Islamic Emirate of Afghanistan attacked an Afghan National Police’s post in Ghazni district. Eight elements of the Afghan National Police were killed and three were wounded, while an element of the Islamic Emirate of Afghanistan was killed in the encounter.